[By Nick, New for 2014] The Sweet Freedom ice cream sandwiches weren't the only "healthy" novelty that Wells sent me. 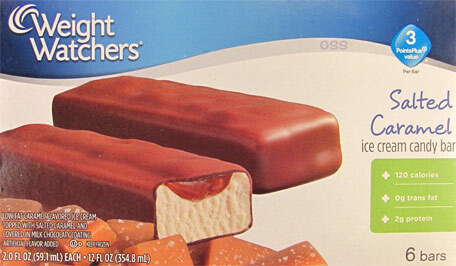 They also included a box of the new Weight Watchers Salted Caramel ice cream candy bars. I'm basically over salted caramel so let's get right into these. Coming in at only 120 calories a bar, I was expecting something extremely tiny. Thankfully that's not the case here. These bars are pretty close to the same size as a snickers/twix/milky way bar you'd find in a six pack box. Biting into the bar is different to say the least. The chocolate shell is kind of chewy and doesn't break easily like your typical ice ‎cream bar. I'm not sure why but I actually like it. Maybe it's the novelty of it but it's different enough to amuse me. The chocolate flavor isn't anything out of the ordinary. It's more on the milk chocolate side but it's rendered irrelevant by the caramel components. The ice cream is a sweet, buttery caramel with hints of salt to it. While not really dense, it still has a respectable quality to it for being something that's low fat. I’d say its step above Edy’s and brands of that nature. While very thin, the salted caramel layer is full of flavor. I can’t believe I’m going to say this but other companies should take note from Weight Watchers. Less is more when it comes to salted caramel. There’s just the right amount to get the saltiness across without overpowering everything else. All and all, I'd say this bar is a win. Not only is it tasty, the nutritional information isn't all that shabby either. This might actually be my favorite new product I've received from Wells this year. Don't let the Weight Watchers name deter you; this one is definitely worth a pick up. Point me in the direction of an 1000 calorie bar please! What?! You actually liked these? I will agree with you on the caramel, it's pretty good, but the ice cream and chocolate were almost flavorless. Is it even chocolate? No, of course not, not for 120 calories. @Anon#2: I had the peanut version long ago and have fond memories of it so I'm not really surprised by this review. @Anon#2: I did really like them. It's a well executed bar and I'd take it over most other ice cream bars any day to be honest.